In the 70s a boy's mother is killed during a factory accident. 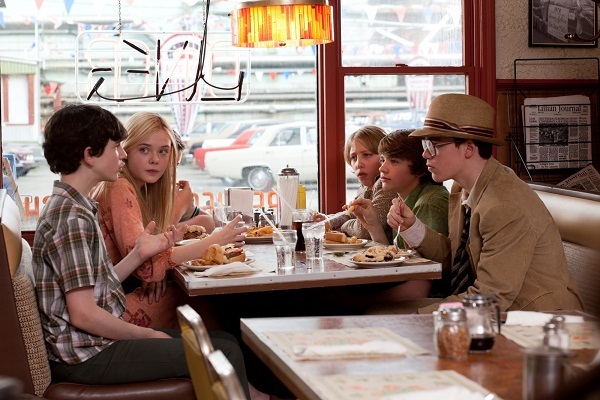 The boy is Joe (Joel Courtney), and rallying around him are his young friends, led by Charles (Riley Griffiths). Charles is making a low budget horror movie with them on his super 8 camera, much to the disapproval of Joe's father, Jack (Kyle Chandler), the town's deputy Sherriff. One night Charles invites the group to a late night filming session. He invites along Alice (Elle Fanning) and Joe takes a quite a liking to her. While filming at a train station they try to use an incoming train as a background to the movie. But the train derails and explodes, forcing the kids to run for cover. When they reach the wreckage a dying man points a gun at them, telling them not to talk about anything they've seen. Days later and strange things are occurring in the town, metal objects are disappearing and it seems like something otherworldly has escaped from the train. This leads to a military intervention on the town, which is disrupting for the filming of the rest of Charles' movie. Alice is also reluctant to come back because of her alcoholic father Louis (Ron Eldard). 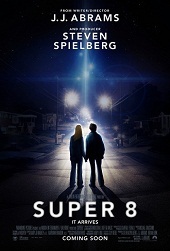 There are three films being made throughout Super 8 and only two of them work.The kid's amateur horror production and J.J. Abrams tribute to a young, free generation have a nostalgic quality to them. There's a level of sweetness about the trouble these kids get into and how they interact with each other. The dynamics of the group are sharp. Their interactions are often very funny and their diction is sound. It's very difficult to capture how children speak to each other but here it's authentic. And because of this and the unique personality of each child the scenes with the group are the most enjoyable in the film. This is essentially a picture for anyone who has ever played with monster makeup, fake blood and plastic soldiers. But rather typically, the adults spoil the fun. The studio's vision seems at odds with Abrams. The film is louder and more inflated than E.T ever could have been. The little guy probably went home so he could hear himself think. Too often there's a lack of restraint here. Take the film's biggest set piece, the train crash. It's deafening and visually striking but it's not enough to simply have the locomotive derail. It also has to be packed with explosives so we can watch it go boom. Then there's the assumption that without caricatures like the pot smoker and the scantily clad rebellious daughter we'd never know the film was set in 1979. The clean neighbourhoods and stereotypes make this look like a movie version of the era. It's also the side characters who obstruct the more interesting main story and provide tonal issues too. There's a disjunction between the playfulness of the kids and the square jawed militarism.It's strange that a film so intent on paying homage to B-grade horror compromises itself by being so serious at times. It's unfortunate because of how funny so much of Super 8 is. The amateur film played over the end credits is hysterical. But as the explosive experts take over in the final quarter, the film starts to read from the Jurassic Park Handbook of Escape Routes. Spielberg is one of the film's producers, which also explains why the film is caught in a tug-of-war between being an aggressive monster picture and something more sentimental. At least the film is never dull, courtesy of the fine performances by the kids. They're all very natural and Elle Fanning grows most emotionally here. There's one noted efforts by the adults like Kyle Chander. His character might as well have been called John Law. Lighten up dad. But as the political climate around the US's immigration policies heats up we're likely to see even more films from Hollywood about alien arrivals. Super 8 is often engaging and entertaining sci-fi entry to this phase, but those looking for a leaner and more sophisticated alien film would do better with Gareth Edwards' low-budget British sci-fi from last year, Monsters.